Orissa occupies an unique position in the ethnographic map of India for having the largest variety of tribal communities.Although they are found in all the districts of the State, yet more than half of their total strength are found in the districts of Koraput, Rayagada, Naurangpur, Malkangiri, Kalahandi, Nauapara, Kandhamal, Baudh, Keonjhar, Sundargarh and Mayurbhanj. 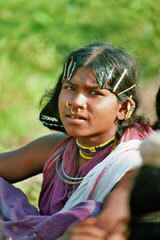 The tribes of Orissa are at various stages of socio-economic development. At one extreme are the group which lead a relatively secluded and archaic mode of life keeping their core culture intact, while at the other extreme there are communities which are indistinguishable from the general agricultural communities. The tribal people express their cultural identity and distinctiveness in their social organisation, language, rituals and festivals and also in their dress, ornament, art and craft. They have retained their own way of managing internal affairs of the village mainly through two institutions namely, the village council and the youth dormitory. The dormitory is the core of tribal culture and it reinforces the age-old traditions. In Orissa this institution occurs among many tribal communities in some form or other. The Juangs call it Majang and Darbar, the Kondhs call it Dindaghar, the Bhuyans call it Dhangarabasa and among the Bondos it goes by the name Ingersin. Of all the tribes the dormitory system is well organized among the Juang. Conspicuous in the village, the Mandaghar is the largest hut. It has wall on three sides and is open in front. The wooden parts and side walls are carried with decorative symbols depicting animals. The boys hang their changu, a flat tambourine like drum which is used at the time of dancing. In front of the Mandaghar is the small open space where dance takes place almost every night after the day's work is over. The dormitory is so to say a school of dancing and expression of the communal art of the people. The elders of the village assemble at the dormitory house every day for every important event in their corporate life. Here they discuss matters concerning the welfare of the village, settle the distribution of swidden and fix date and time for celebration of the village festivals, etc. In these respects the dormitory may be considered as the centre of social, economic and religious life of the village.